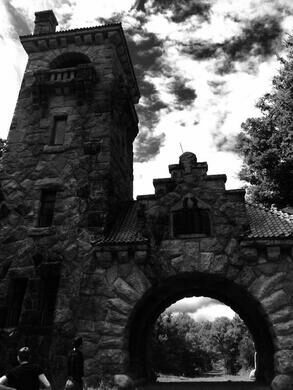 Less than 100 miles north of Manhattan is the Lake Mohonk Mountain House gatehouse, which served as the entrance to the historic resort for almost 30 years. It also did a little acting, appearing in the 1985 cult horror movie The Stuff. The gatehouse, originally dubbed the Smiley Testimonial Gateway, was built in 1908 to mark the 50th wedding anniversary of Albert and Eliza Smiley. But the Lake Mohonk resort goes back much further than the gatehouse, to the early 1870s when the original hotel was built by Albert and his twin brother Alfred as a mountain retreat and nature preserve. When the gatehouse was added almost 40 years later, it served as the formal entrance to the resort, and from 1908 to 1935, anyone visiting would first travel down its scenic road lined with towering oak trees. The Lake Mohonk Mountain House and the surrounding nature preserve have enjoyed landmark status for decades, even earning a United Nations Environment Programme Award for their forward-thinking stewardship of the land. Since 2013 the gatehouse itself has been protected, joining those ranks and being designated as a historic landmark by the Town of New Paltz Historic Preservation Commission. As for that 1985 horror movie, that counts as preservation too.